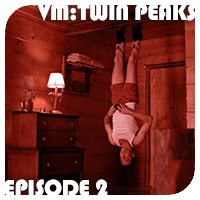 Cooper’s investigation into the murder of Laura Palmer continues, as her secret boyfriend James Hurley is interrogated, and it appears that both trucker Leo Johnson and Laura’s psychiatrist Dr. Jacoby may have some connection to the crime. Laura’s best friend Donna and Audrey Horne vow to solve the murder. Years ago I purchased a copy of an audio cassette called “Diane” that features every voice dictation that Agent Cooper makes to Diane during the series (there’s even some unused segments!) which I like to listen to on my walkman while doing digital coloring. Also, are you guys watching the Log Lady intros before each episode? The dvds have a feature where you can watch them and (although the sound quality isn’t great on those) I totally recommend. We’re watching on Netflix, so there are no Log Lady intros. That said, we may need to switch to DVD.